This is a high protein, high fibre meal rich in antioxidant micronutrients from the herb and spice combo. Serve with plain Jasmine rice garnished with strips of lime zest. The paste is the key to a good Thai curry. It's easy to make your own curry paste, making the curry fragrant and rich in zingy flavours. 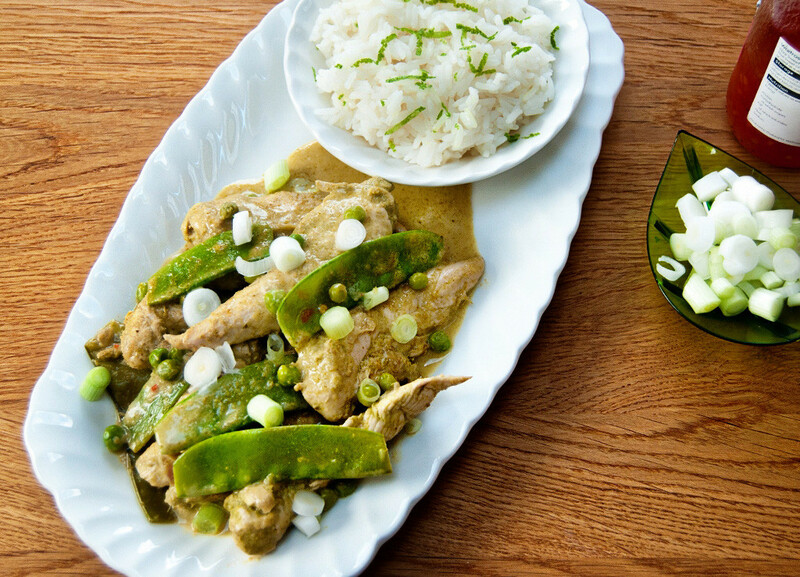 Check our recipe for homemade Thai green curry paste. Cut the skinless chicken breasts into 3 cm wide strips, put in a bowl and mix with 4 tablespoons of the curry-paste. Chill for at around15 minutes. In the meantime peel and finely slice the shallots, peel and finely grate the ginger. Bruise the lemon grass stalk by pressing it with the blade of a knife. Put the tamarind paste in a jug and mix with 150ml of boiling water. 3. Heat the oil in a large frying pan add the shallot, sprinkle with a little salt and cook over a medium heat for 3 minutes, stirring frequently. Add the grated ginger and cook for another couple of minutes. Stir in the remaining two tablespoons of curry paste and cook for 2-3 minutes. Add the marinated chicken and fry for 5 minutes, stirring frequently. Add the tamarind liquid, coconut milk, kaffir lime leaves and lemon grass stalk to the pan and bring slowly to a simmer. Simmer gently for about 15 minutes, until the chicken is thoroughly cooked. Add the peas and mangetout to the pan, then the soy, fish and chilli sauce. Cook for a further 6-7 minutes. The vegetables should still be a bright green. Remove from the heat and discard the lemon grass stalk and the kaffir lime leaves. Sprinkle with the salad onions and coriander and serve immediately.